Gaeton Gialloreto, of Philadelphia, PA, returns a shot on the the advanced-player pickleball courts in Ocean City, Saturday June 30, 2018. OCEAN CITY — Nobody is quite sure when the best players in Ocean City's cutthroat pickleball scene went from being called — perhaps a bit generously — the "advanced" and became known — ping, pop-ping, ping-ping, pop, thwap! — as "the aggressives." But in mild-mannered Ocean City this summer, there's an epidemic of them. Shore Envy: Seaside getaways in Ocean City, N.J.
"If you're right-handed, I'll try to hit your left shoulder," says Mike Colombo, 67, a retired gym teacher from Pennsauken who moved to Ocean City to live out his pickleball dream, explaining how the aggressives play this game, which employs a hard paddle and a modified Wiffle ball, on a half-size, tennis-like court where the area near the net is known as "the kitchen," about which there are many rules. What's your level of play, Mike? "What would you say, Murph?" he says to fellow pickleball crank Bob Murphy, 79, a retired sheet-metal worker from Drexel Hill who's also living the pickleball dream off his Local 19 pension, dividing his time between Marathon Key, Fla., and Ocean City. "Aggravation," Murphy replies, cracking them both up. "Please," Murphy adds, "tone me down." Down the Shore, it seems every day another tennis court is slain, and two pickleball courts rise from the rubble. Improbably, nowhere is this pickleball intensity more palpable than in Ocean City, the usually laid-back Shore town whose historic claims to fame of pizza and temperance have yielded to its status as a mecca for pickleball, a shrunken version of tennis that combines elements of badminton, racquetball, and ping pong. The game has its roots in Washington state, where in 1965 a guy with a dog named Pickles made up a game. Or maybe it was a guy with a bad knee who was told by his wife he was in a "pickle." Or maybe it was from the term pickle boat, manned by the leftovers. Nobody knows. 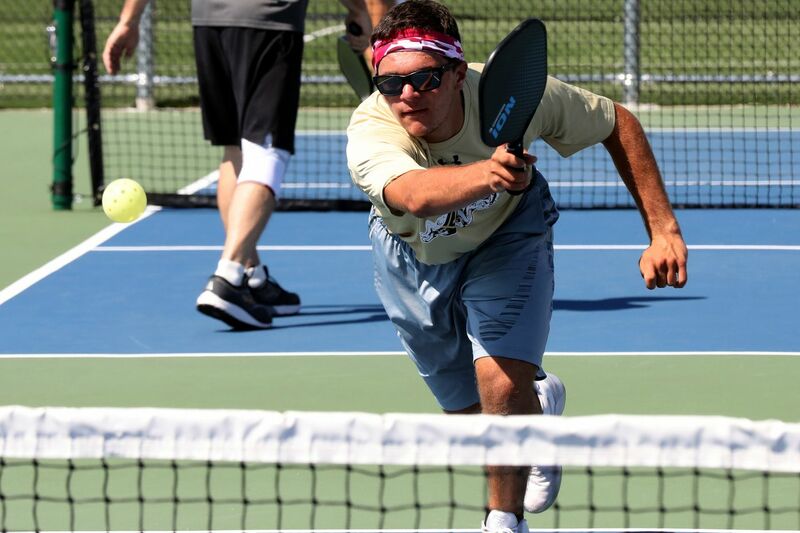 But in the last few years, pickleball has exploded from a few dozen places to play nationally to more than 4,000. "It's the fastest-growing sport that no one has ever heard of," jokes Allan Dansky, 80, who travels from Avalon to Ocean City to play because his girlfriend has a house there. It's true. Just check pickleball.net, he says. And his girlfriend is next door exercising in the community center. The court hierarchy has been long established by the time any summer people show up. In Ocean City, it's the aggressives vs. everybody. "If you want to talk to nice people, go to Stone Harbor," says Murphy. And if you think that doesn't sound like the Ocean City you know, you have not seen pickleballer-in-chief Murphy on a day when he thinks he may be denied his daily game at 17th and Haven, where 12 sleek courts built last summer have made the three tennis courts they replaced a distant memory. With the pickleball courts on their third day of being out of service due to some repairs to the fence, Murphy is on this day, well, more than a little half-sour. By 9 a.m. the pickleball courts in Ocean City were almost full on a June Saturday. In Ocean City, the court hierarchy has been long established by the time summer people show up. Weekdays are played like pickup games, players rotating out after two games played till 11 points, paddles lined up as a waiting list. "The last four courts, we put the more aggressive group there," says Colombo, the Pennsauken retiree. Middle courts are for "the moderately aggressive." First four courts are "let's be friends," he says. "We start at 7:30 a.m.," he notes. "The aggressives, we take over probably all the courts. Starting at 9:30, 10, the moderately aggressives arrive and then we start surrendering courts all the way down. By that time, after two hours, people are ready to drink their Geritol, change their Depends." It's not all old guys (lots of women are among the regulars), but like any addicting game that's got a reputation for being easy on the knees, it's filled with them. This year, Ocean City added a buffer of trees along Haven Avenue to cut down on early-morning pinging sounds. "The pickleball sound annoys everybody," Murphy says. You really don't want to be the house across from the pickleball courts on your week at the Shore. "Because we start so early," he says. So addicting is this game that a three-day hiatus from the usual 70-strong bustle of the weekday rotate-in-and-out game has seriously rattled Murphy. Plus, his wife is mad at him and he was counting on a two-hour cooling-off period. And he's put on two pounds, he says. He is either going to play anyway or he wants his money back. The fee is $50 a season, Murphy notes. "That's 68 cents a day, Memorial to Labor Day," he tells Samantha Ravelli, the attendant in the pickleball trailer. "You've got to pay me back. There is no reason for it to be closed. Come on, give me a break. You owe me $2.04." No 68 cents is forthcoming, and Murphy's not going anywhere. Some of the other guys start to show up. They make a quick plan to commandeer their way into the closed courts, which requires simply opening the gate and going inside. Nobody bothers them. Bob Murphy, of Ocean City and Marathon, Fla.., returns a shot on the the advanced-player pickleball courts in Ocean City. Soon, a cast of typical pickleballers has arrived. There's former tennis player Rick McMullin, 59, of Oklahoma City, in town because his wife's family has a house down the Shore. You can tell the tennis players. They take a big windup. At first, they swing and miss, thinking their paddle is as long as the tennis racket they happily retired. But soon pickleball instincts take over, more nuanced, quicker, slicier, dinkier. You can take a shot to the groin from a pickleball ball and it probably won't require a trip to urgent care, or an apology. "It can sting a little," says Dansky, the 80-year-old. There's Brooklyn-bred Dave Marks, 70, who won't stop talking about how popular pickleball is in Kissimmee, Fla., where he lives half the year. With 6,000 homes in his community, 1,100 people play pickleball, he says. Florida is the place from which pickleball migrated to the Jersey Shore, paddles and balls stashed in the trunks of white sedans with Florida plates driven by snowbirds to their summer homes. It caught serious fire last year and has only grown, says Ocean City spokesman Doug Bergen. There are 210 people who pay the $50 memberships. Murphy, whose forehand slice down the line remains his ticket to pickleball paradise, finally gets to play. The truly advanced players play a close-into-the-net game of "dinking," which might not sound like high-level stuff, but that's pickleball elite play. "There are players who can dink forever," says Dansky. "You dink for a while waiting for them to either hit it in the net or hit it too high. Then you slam it back." Fist and paddle bumps at the end of a game on the advanced-player pickleball courts in Ocean City. Clockwise from left: Dave Marks of Kissimmee, Fla., Rick McMullin of Oklahoma City, Jack Earl of Ocean City, and Bob Murphy of Ocean City and Marathon, Fla. In the end, after a spirited session of aspirational dinking, the players do the traditional clinking of their paddles. "Like the end of the Stanley Cup playoffs where you line up," says Jack Earl, 69. The whole day has gone off nicely, despite the rocky start. But Samantha the attendant finally puts a lid on the rogue play, sending Murphy home to his wife early. To make amends with a nice walk on the beach. The courts will be open the next day, and they will again be packed with pickleball players. Pickleball normalcy, a relative term in Ocean City with this crew, will resume.